STORRS - It has been more than a full calendar year since the UConn football team won a game against an FBS opponent. But those 12 consecutive losses aren’t what concerns Randy Edsall right now. The UConn coach delivered what he felt to be some hard truths about his program Tuesday. “I could care how many we win or lose right now. I really could. If we don’t get the culture right and we don’t get the program established, you’re never going to be a consistent winner anyhow,” Edsall said. The Huskies are 1-7 this season, 0-4 in American Athletic Conference play. They play at Tulsa, which is also 1-7, Saturday night. Victory is in the game plan, it seems, but just not maybe in the expectations. “I want to win as much as anybody but we’re not ready to win yet,” Edsall said. Edsall is in the second year of his second stint as the Huskies’ head coach, having first served in that capacity from 1999-2011. He admitted that his current job in Storrs is very similar to his first. 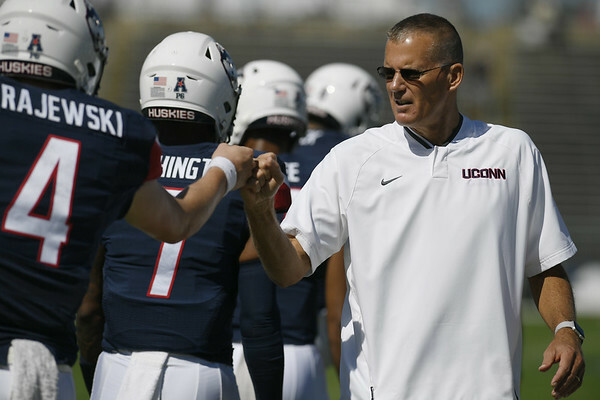 Edsall was the coach when UConn transitioned from FCS to FBS, then known as Division I-AA and Division I-A. He left the Huskies to become the head coach at Maryland just after UConn’s loss to Oklahoma in the Fiesta Bowl. Victories aren’t the only measurement of a program’s rise, Edsall insists. He recalled his former boss agreeing with that notion in the early days of his head coaching career. Edsall’s players want to win, of course. They understand their coach’s message, however. “I know what he’s trying to say. He’s here to develop young men, he’s not here to develop football players,” defensive tackle Caleb Thomas said. “I know what he’s talking about when he says ‘Everybody’s making this about winning’ and things of that sort. To that end, Edsall said he’s focusing on off-the-field issues as much as on-field ones at this point. Backup quarterback Marvin Washington will not travel with his teammates to this weekend’s game against Tulsa. The redshirt freshman from Orlando was demoted and worked with the scout team in Tuesday’s practice. “He just didn’t take care of responsibilities he’s supposed to,” Edsall said, explaining the move. The coach then used Washington as an example of the culture he’s trying to establish with the Huskies. With Washington no longer in the No. 2 spot behind starter David Pindell, it will fall to either junior Brandon Bisack or true freshman Steven Krajewski to be the backup Saturday. Bisack backed up Pindell earlier this season when Washington was similarly punished. Mike Crispino and Wayne Norman will call the UConn football game at Tulsa on Saturday for a radio broadcast on 97.9ESPN-FM. Because of that, Bob Joyce and Randy Lavigne will call the Husky men’s basketball team’s exhibition against Southern Connecticut State Friday night in Storrs. Backup defensive end A.J. Garson went down with an apparent knee injury late in Tuesday’s practice but the severity of the injury was not immediately clear. Edsall said he didn’t believe it was serious. … Tight end Tyler Davis (ankle) is limited but could ready to play by the weekend. … Saturday will be UConn’s first-ever game in the state of Oklahoma. The Huskies have played two previous games against teams from the state, 2017 against Tulsa in East Hartford and the 2011 Fiesta Bowl against Oklahoma. … The Huskies piped in crowd noise during its practice outdoors Tuesday in preparation for Saturday night’s game at Chapman Stadium in Tulsa. Posted in Newington Town Crier, UConn on Wednesday, 31 October 2018 20:51. Updated: Wednesday, 31 October 2018 20:54.